April 1, 2013 | David S. Maldow, Esq. This completes our three part wrap-up of Enterprise Connect 2013. Our first article on the 2013 conference sessions, which was co-authored with Dimension Data Principal Consultant David Danto, covered such themes as UC, Interoperability, WebRTC, "Good Enough" Video, and Future Visions. The second installment covered thoughts on the announcements and booth displays from Cisco, Vidyo, Polycom, Smart, TelyHD, BlueJeans, Vidtel, and Yorktel. Today, we close things out with a quick look at the rest of the vendors we had a chance to check out, including Magor, Zoom, StarLeaf, AGT, PanaCast, Nexistant, ClearOne, Logitech and LifeSize. Thanks to everyone who took the time to chat with us and share their stories. We look forward to seeing you all at the next show. And once again, apologies if we left anyone out. Please be sure to check out our Conference Coverage and Part 1 of the Booth Crawl to get the full EC experience. It was particularly nice to see the Magor team and to get a quick demo of their new "Aerus" cloud service. I took a deep look at the Magor solution back in 2010 and thought it was, in many ways, ahead of its time. In particular, its workflow and collaboration capabilities allowed users to control their meetings in ways that few solutions, even today, can rival. It is a democratized environment in the sense that all meeting attendees are equal and have completely control over their individual experience. There is no host, or need to pass presenter status. Everyone in the meeting can share, access and control any document or application in the meeting. Any meeting attendee can invite new attendees and control who they see, as well as who sees them, with a freedom far beyond typical video solution layout controls. You have to really see the UI in action to fully understand how it encourages active participation in working sessions. Magor is also notable for its peer-to-peer architecture. Most competitive solutions leverage a centralized architecture, where an MCU, router or some "command center" application helps manage the conferencing traffic, particularly in multipoint calls. On the other hand, a peer-to-peer environment has no central server requiring additional ports or licensing as more endpoints are added, which makes it theoretically much easier to scale. I spoke with Ken Davison (CMO and SVP Sales for Magor) who explained the value of Magor's architecture approach as follows, "We at Magor think video needs to built on a switched architecture where users (endpoints ) have flexibility to access, control and can manipulate a "mashup" of streams (real-time conversations and collaboration). We also think that "meet-me on the bridge" is just one workflow of many - not the workflow that the entire architecture must be built around." With all of these unique benefits, many in the industry have been wondering why Magor was keeping quiet for the last year or so, but now the answer seems clear. 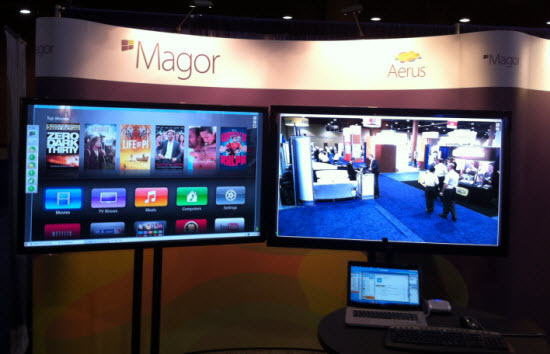 When I last covered Magor, their offerings were primarily packaged in big hardware, as key market segments appeared to be primarily interested in the stereotypical 2 or 3 screen telepresence meeting room solutions. 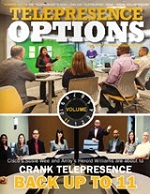 Today, the focus has clearly shifted to cloud solutions with multiple interop options. My guess is that Magor was wisely taking the time to adjust their offerings to meet the new demands of the market. Fortunately, for Magor, although packaged in hardware, they were never really bound by the hardware as their solution ran on Linux rather than being DSP based. As a result the shift to a pure software product was relatively painless. This pure software foundation also helps to explain how Magor is able to quickly add native interop to their client, rather than relying on transcoding gateways. Aerus is basically everything I liked about their previous offerings, re-envisioned into a software based cloud service featuring interop to traditional VC products, Skype, and even a WebRTC client (on Chrome, for now). A great example of a company shifting to roll with the tide. Aerus maintained that unique Magor workflow and powerful collaboration, and it will soon be working on any device (tablet / phone pending) as well as still being available for purchase as complete hardware appliances. I covered this new technology a few months ago, and I don't think you are all understanding exactly how cool this is. It is completely unlike anything else in our industry so it takes a minute to wrap your head around premise of this potential game-changer. I think many people are dismissing it as simply videoconferencing with a panoramic view, rather than a typical 16:9 window. This is not what PanaCast is about. It is rarely ideal to view a meeting in a panoramic view. The real use of this solution is to provide the same standard 16:9 view we expect from videoconferencing. The only difference is that since the camera captures the entire room (panoramically), the viewer can focus on and view any particular area in that room, without having to physically move the camera, using typical touch screen (pinch, swipe) controls. Quite simply, it is a way to let the viewer look around the entire room, without being disruptive. This is incredibly useful for countless situations, the most obvious being to follow the current speaker during dynamic meetings. Other solutions use pan/tilt/zoom cameras to look around a room. These moving cameras, even the quiet ones, can be distracting. Some call it the "bad robot effect." On the other hand, there are no moving or distracting elements of the discrete PanaCast camera. 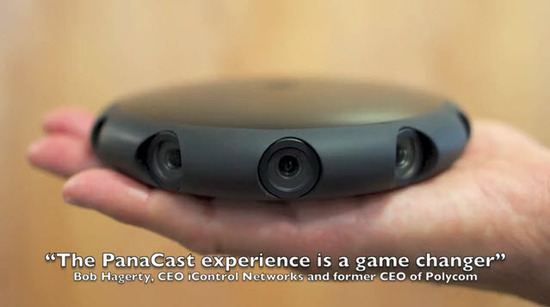 No matter how much the remote viewers change their individual view of the room, the PanaCast camera just quietly sits there capturing everything. The best way to understand it is to try it for yourself. Download the PanaCast app on your tablet/phone and try the demo. After a few seconds of pinching and swiping around streamed video it should start to click. Now just imagine having that capability during a live video meeting. PanaCast has some great new features in the works. CMO and Co-Founder Lars Herlitz, and VP Dan Sibille showed me some of the cooler tricks at their booth. I think my favorite feature was the ability to start a meeting via QC code or NF. In other words, I pointed my iPhone at their demo camera and was immediately able to invite remote PanaCast viewers (anyone with the free app) to see and hear me live. They are also working on making it more of a bi-directional interactive experience. The real sweet spot right now is for meetings where the active participants are mainly in the room, and the remote participants just don't want to miss anything, but may want to chime in on audio. By adding bi-directional video, the remote participants can be viewed on a standard monitor in the meeting room, allowing them to fully engage. Note: while it is possible, I don't think most use cases will require PanaCast cameras for multiple users in the same call. I overheard other booth visitors asking about PanaCast to PanaCast calls and I don't think they are truly getting it. The more logical use case is one PanaCast in the meeting room at the center of the action, with remote participants sending video back to the meeting room using standard VC cams or webcams. To put it plainly, no one needs a PanaCast view of me, sitting at my desk. Take a second to make a mental checklist of everything a completely disruptive new business class VC solution should have. Now compare your list to Zoom's UME offering and with its new interop capabilities, and tell me if they don't seem to be covering it pretty well. My list is only missing a few items at this point (and Nick Chong, Head of Product, assures me they are coming soon). So why isn't this a bigger story? Is there an assumption that it is commercial quality because it was initially free? Or are we all just jaded by so many underwhelming disruptions in the last few years that we don't know a real game-changer when we see it? Let's go through the list. Quality: It is surprisingly good. 1 to 1 calls are free, so test it out for yourself. Affordability: $9.99 per month for unlimited use of a fully featured 25 seat room. That includes everything from recording to the new interop functionality. There are no separate fees or services. The free version limits multipoint use, but other than that, it may the most powerful free collaboration app for desktop / tablet / phone. Accessibility: The nearly fully featured mobile client compares nicely to limited competitor apps. In fact, it is one of the only (and possibly the first) VC app to support doc sharing from, as well as to, an iPad AND iPhone. Interoperability: H.323 (available in May). Others pending. User Experience: Zoom offers one of the cleanest, most intuitive UIs out there, and it is consistent across all devices. Speaking of user experience, Nick showed me a beta feature worthy of separate discussion. Dual monitor support. The two monitor desktop is very common, but for some reason very few collaboration solutions are putting any thought into supporting it. Zoom's UI will allow for several improved experience meeting scenarios. 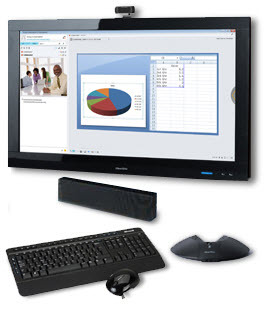 For example, users can display a full view of the data being shared on one monitor, and a full sized view of the active speaker on the other monitor, or replace either one at any time with a Brady Bunch view of all attendees. This seems so obvious, why isn't everyone doing it?! At first, I thought Zoom applied to how quickly users can make calls on the solution. Now, I think Zoom refers to how fast their development team continuously improves the platform. Remember, this company first launched less than 8 months ago and now it has some industry leading features and fast growing usage, with over 750k "participants" (which I assume means unique logins). There are still a few gaps in the feature set, but I see no reason to think they won't knock out the remaining missing pieces (PSTN dial in, etc.) in real time. Videoconferencing kiosks are a very interesting section of our industry. While everyone seems to take it for granted that they will eventually be everywhere, very few people understand the problems that must be solved to make this happen. You can't just slap a webcam on an ATM and call it a banking kiosk. I spoke with Larry O'Connell, CEO of Nexistant, to learn more about the inside world of video enabled Kiosks. The first surprise was that it isn't all about banks. 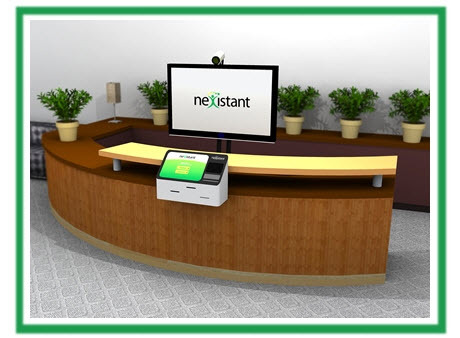 In fact, Nexistant is focused on providing "Virtual Attendants" for lobby / reception areas. The benefits of providing face to face service, without the cost of a dedicated receptionist at each location, is clear. In addition, the kiosks can capture images of guests and immediately print out whatever badges may be needed to access the approved areas. The potential to be more than just a communications device opens this up to a number of possibilities. The real power of the solution happens behind the scenes. When someone walks up to a Kiosk, the solution has to decide which available agent to connect with. The Nexistant system allows the agents to list their level, from 1 to 10, for various skills. The solution then runs an algorithm, based on the unique needs of the guest at the kiosk, to find the ideal agent. The agent can even go as far as to control the interface at the kiosk, in other words, drive it remotely, to help the guest if needed. Nexistant was one of the winners of the EC Innovation Showcase. So I guess I am not the only one who thinks Larry is doing something right. I don't think there is a single vendor that I cover which can come close to the monumental expectations that StarLeaf�faces. We can still feel the vibrations from the 100 megaton industry disruption known as the Codian bridge. Think I am wrong? Take a peek at today's Cisco VC infrastructure and tell me you don't still see Codian DNA. So when the Codian team got the band back together and came out with StarLeaf two years ago, it had to really be something special. In fact, it was a very smart solution, uniquely addressing many adoption hurdles, with a user interface so advanced that it still easily one of the best in our space. StarLeaf Director of Ops & Marketing, Hellene Garcia, walked me through some of the newer features of the fully cloud based platform, including new endpoint options to provide more flexibility. 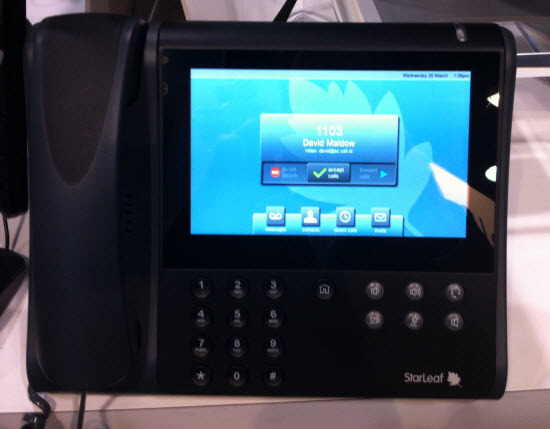 For example, some users enjoy the feel of a classic telephone handset for their audio, while others will appreciate the smaller footprint of the new handset free StarLeaf Touch. Similarly, some users will want the all in one Personal Telepresence solution, while others would rather use their existing PC and monitor with the PT Mini. Finally, users who want to make calls on their own devices can use the Breeze client and enjoy the same StarLeaf experience. StarLeaf is designed to be the clear user's choice, but this is an industry where sales can be based more on channel relationships than user preference. User experience should be the primary purchasing factor, since it is the key to endemic adoption. But let's be honest, there are a lot of business class users out there today making calls on various solutions with good video and mediocre user interfaces. This goes for admin interfaces as well. While I was standing at the booth, Hellene let me into the admin menu to create a user account for myself. With no training I created the account, and then provisioned a phone with that new user account, and made my first call within minutes. Anyone can manage this environment, so save your IT guru for the complicated stuff. StarLeaf is getting some traction, particularly in Europe. Whether they can go viral here remains to be seen, but the bottom line is that there is a lot to be learned from the StarLeaf UI and caller workflow. After a quick demo and review of the benefits with Hellene, it is hard to walk away without thinking that it would be very cool to work in an office with a full StarLeaf deployment. In this rapidly evolving industry, a smart company takes advantage of a good opportunity to pivot and better leverage its strengths. A great example is AGT, which has a wealth of video skills, technology and expertise. 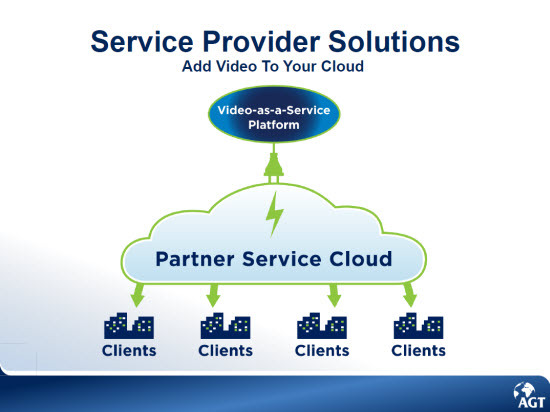 While they continue to have direct customer success, they noticed an potentially bigger opportunity to turn their top notch Managed and Cloud Video Solutions into the foundation of a partner program with service providers. AGT realized that many service providers were missing the video piece to a complete offering. By white labeling AGT cloud video and managed services, these firms can now fully cover their customers communication needs. This isn't a theoretically strategy, AGT was able to show off a number of existing partner branded apps at their booth. Video is difficult, but service providers need to find a way to support it. The choices are clear, they can partner with a video expert, or develop / purchase the expertise themselves. If they choose to partner, they definitely should AGT keep on the short list. These guys know video, they have experience, they are currently supporting Fortune 1000 companies in the field and have been doing so for some time. The big question about ClearOne in the video world is whether theses gurus of audio will be able to properly leverage the VC technology they recently acquired in the VCON deal. Video isn't easy. ClearOne is taking this seriously, with the appointment of Adi Regev to VP of its VC business. Adi is an industry vet, and it was great to catch up with him and share his vision for ClearOne in the video space. 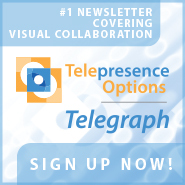 Stay tuned for more ClearOne VC news coming soon. Speaking of audio gurus, the Phoenix booth was well attended, with many people having a lot of good things to say about the Phoenix Quattro. For more info on this great device, please read my full review here. Another hot USB powered peripheral is the Logitech Conference Cam. When I first reviewed this device, I was a little concerned that people might dismiss it as being too different. The eyeball on a stick is certainly very different than the typical webcam configuration. However, judging both by the booth attendance, and word of mouth around the show floor, people understand the value of this device. Standard webcams are good for 1 on 1 meetings, but they don't cover a group well. The "crowd around the webcam" meeting is not ideal. This camera provides meeting room coverage, with easy USB setup, and in the consumer price range. They were also demoing the new C930e. 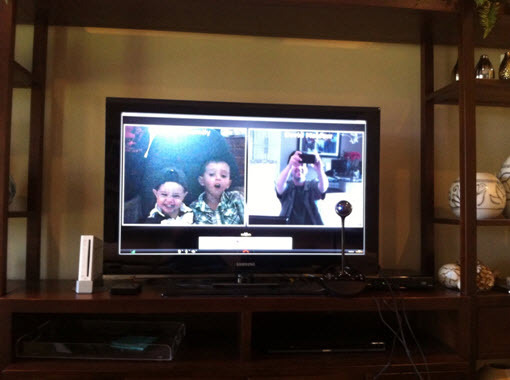 This webcam offers a wider field of view, like the conference cam, but in a standard monitor-top format. 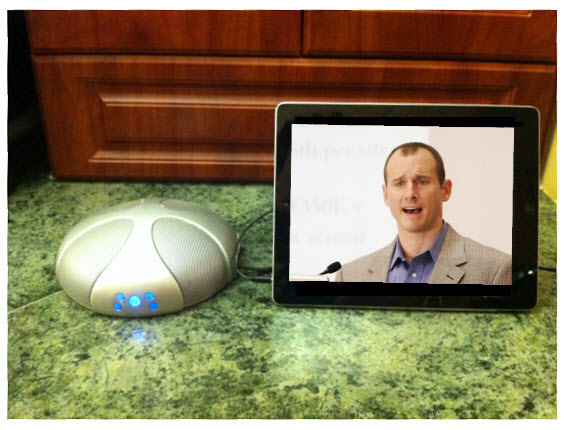 Another great option for small meeting rooms, or even a single speaker presenting on a whiteboard. In general, Logitech is aware of the shift from desktop to mobile devices and is re-inventing themselves as a peripheral company providing solutions for the "last inch" of UC deployment. In other words, it isn't just about mice and keyboards for desktops anymore. One great example is their Keyboard Case for the iPad. Every time I open up my iPad at these events, someone asks about this device, and asks for a quick demo. If they can continue to find great new products like this for the tablet and phone market, they should be able to deal with a potentially shrinking mouse market as tablets continue to eat away at desktop sales. Everyone appears to be very interested in the current business politics of LifeSize. There was more talk about which booth they were at, than what they were demoing (LRS1000 for Lync). Without knowing any of the inside details, people seem very comfortable making assumptions and assigning blame. Business isn't easy and I certainly don't have the answers, but we shouldn't let industry gossip let us lose sight of the what is really important. This is a good company, with great technology. Even in the midst of all this confusion, they are putting out impressive new endpoints, while making nice progress along their UVC roadmap to provide a complete cloud-based collaboration infrastructure. Whether their current partners find a way to leverage their strengths, or whether they find a new home, their continued contribution to the industry is valuable. I hope they can steer through these rough waters, and I really hope to start seeing the full team at these events again soon. This completes our three part wrap-up of Enterprise Connect 2013. Our first article on the 2013 conference sessions, which was co-authored with Dimension Data Principal Consultant David Danto, covered such themes as UC, Interoperability, WebRTC, \"Good Enough\" Video, and Future Visions. The second installment covered thoughts on the announcements and booth displays from Cisco, Vidyo, Polycom, Smart, TelyHD, BlueJeans, Vidtel, and Yorktel. Today, we close things out with a quick look at the rest of the vendors we had a chance to check out, including Magor, Zoom, StarLeaf, AGT, PanaCast, Nexistant, ClearOne, Logitech and LifeSize. It was particularly nice to see the Magor team and to get a quick demo of their new \"Aerus\" cloud service. I took a deep look at the Magor solution back in 2010 and thought it was, in many ways, ahead of its time. In particular, its workflow and collaboration capabilities allowed users to control their meetings in ways that few solutions, even today, can rival. It is a democratized environment in the sense that all meeting attendees are equal and have completely control over their individual experience. There is no host, or need to pass presenter status. Everyone in the meeting can share, access and control any document or application in the meeting. Any meeting attendee can invite new attendees and control who they see, as well as who sees them, with a freedom far beyond typical video solution layout controls. You have to really see the UI in action to fully understand how it encourages active participation in working sessions. Magor is also notable for its peer-to-peer architecture. Most competitive solutions leverage a centralized architecture, where an MCU, router or some \"command center\" application helps manage the conferencing traffic, particularly in multipoint calls. On the other hand, a peer-to-peer environment has no central server requiring additional ports or licensing as more endpoints are added, which makes it theoretically much easier to scale. I spoke with Ken Davison (CMO and SVP Sales for Magor) who explained the value of Magor's architecture approach as follows, \"We at Magor think video needs to built on a switched architecture where users (endpoints ) have flexibility to access, control and can manipulate a \"mashup\" of streams (real-time conversations and collaboration). We also think that \"meet-me on the bridge\" is just one workflow of many - not the workflow that the entire architecture must be built around.\"
Quite simply, it is a way to let the viewer look around the entire room, without being disruptive. This is incredibly useful for countless situations, the most obvious being to follow the current speaker during dynamic meetings. Other solutions use pan/tilt/zoom cameras to look around a room. These moving cameras, even the quiet ones, can be distracting. Some call it the \"bad robot effect.\" On the other hand, there are no moving or distracting elements of the discrete PanaCast camera. No matter how much the remote viewers change their individual view of the room, the PanaCast camera just quietly sits there capturing everything. Affordability: \$9.99 per month for unlimited use of a fully featured 25 seat room. That includes everything from recording to the new interop functionality. There are no separate fees or services. The free version limits multipoint use, but other than that, it may the most powerful free collaboration app for desktop / tablet / phone. At first, I thought Zoom applied to how quickly users can make calls on the solution. Now, I think Zoom refers to how fast their development team continuously improves the platform. Remember, this company first launched less than 8 months ago and now it has some industry leading features and fast growing usage, with over 750k \"participants\" (which I assume means unique logins). There are still a few gaps in the feature set, but I see no reason to think they won't knock out the remaining missing pieces (PSTN dial in, etc.) in real time. The first surprise was that it isn't all about banks. In fact, Nexistant is focused on providing \"Virtual Attendants\" for lobby / reception areas. The benefits of providing face to face service, without the cost of a dedicated receptionist at each location, is clear. In addition, the kiosks can capture images of guests and immediately print out whatever badges may be needed to access the approved areas. The potential to be more than just a communications device opens this up to a number of possibilities. Another hot USB powered peripheral is the Logitech Conference Cam. When I first reviewed this device, I was a little concerned that people might dismiss it as being too different. The eyeball on a stick is certainly very different than the typical webcam configuration. However, judging both by the booth attendance, and word of mouth around the show floor, people understand the value of this device. Standard webcams are good for 1 on 1 meetings, but they don't cover a group well. The \"crowd around the webcam\" meeting is not ideal. This camera provides meeting room coverage, with easy USB setup, and in the consumer price range. In general, Logitech is aware of the shift from desktop to mobile devices and is re-inventing themselves as a peripheral company providing solutions for the \"last inch\" of UC deployment. In other words, it isn't just about mice and keyboards for desktops anymore. One great example is their Keyboard Case for the iPad. Every time I open up my iPad at these events, someone asks about this device, and asks for a quick demo. If they can continue to find great new products like this for the tablet and phone market, they should be able to deal with a potentially shrinking mouse market as tablets continue to eat away at desktop sales.